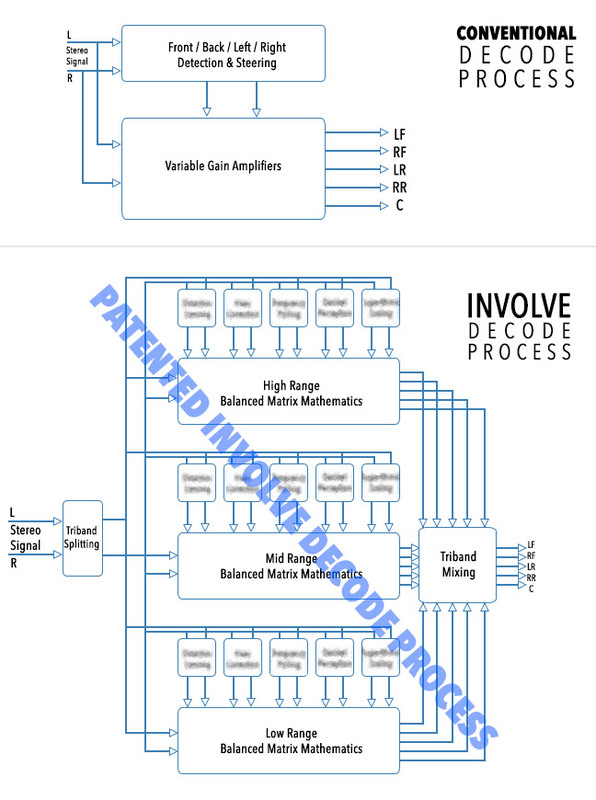 Involve is a system of encoders and decoders through which stereo sound is passed and then is presented to a listener precisely as it was recorded…in full surround sound! In even more technical terms Involve is a 4/5 -> 2 -> 4/5 matrix encode and decode system. It has full circular capabilities, and precise surround sound placement that is as good, and in most cases is noticeably better than discreet multi-channel audio or on-the-fly surround reproduction systems. It has no pumping, no surging, no smearing, no audio artifacts, no additional echo and a flat frequency response. It is able to decode all known encoding matrices from Dolby®, DTS, QSOUND® etc, as good or better than each system’s own decoder. It is able to extract surround information from existing stereo-only tracks, and presents a precise surround stage with no preference to the front or back of the setup. The transition from front to back is every bit as smooth as the transition from left to right. The system also places instruments and voices, and sound effects in the room accurately. The instruments aren’t smeared between two speakers or across the room diagonally. Voices stay at the front of the stage where they belong, with only echo and ambiance at the rear, unless the voices were intended to be elsewhere in the room. Involve provides up to 40dB of separation, which means each and every sound is distinct and clear. In practice it means sounds that were previously hidden to a listener can now be heard clearly. Involve is also a system capable of delivering a true 3D sound stage and extracts the height dimension when this is recorded. The result is that a listener becomes much more involved and engaged in the sound environment that is being reproduced. Involve is able to extract audio cues that studio engineers missed or were unaware of and then the reproduction of a down-mix from discreet surround into our format and back again. Involve actually extracts more information than was originally present in the discreet channels and does it accurately, further improving the audio experience. The Involve 2 channel down-mix is a perfectly listenable stereo mix, with no indication that there is any additional information for surround sound. This means it can be used as a recording format for TV, CD, VD, broadcast on FM, television, or for the Internet. It is completely transparent, with no fear of incompatibility with current stereo equipment. The system minimizes bandwidth requirements.